Buffalo Bills C Eric Wood is reportedly back at Bills practice. 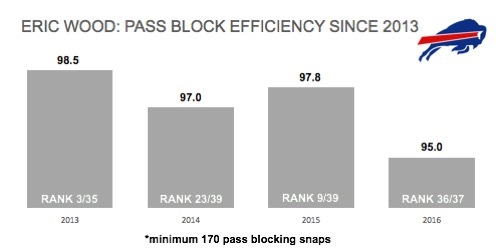 The Bills hope Wood returns to 2015 form to compete in a division full of formidable interior defensive linemen. The ninth-year veteran center was sent to IR after breaking his leg in Week 9 of the 2016 campaign. He’s expected to be full go by the time camp starts. Prior to his injury, Wood had started every game since the start of the 2013 season. He made his first Pro Bowl after a career year in 2015, in which he ended up as the fifth-highest-graded center with a grade of 84.1. He saw a drop in production in 2016, and allowed 21 total pressures in the nine games that he started. He ended the season allowing the ninth most pressures among centers and earned an overall grade of 71.2, ranking him 32nd in the league. In his absence, backup Ryan Groy performed well, and ended above Wood in pass-block efficiency (with 97.7) and gave up just eight total pressures in his 262 pass blocking snaps. Wood participated in Bills practises Thursday, and the team will hope he returns to the form he found in 2013 and 2015, where his 98.5 and 97.8 pass-block efficiency ranked him the third and ninth in the league among the league’s centers, respectively.